The response for my books has been overwhelming today! Thank you all from the bottom of my heart. To preserve stock of books so that I have some to bring to MQX in 10 days, only the next 10 orders will be shipped immediately. I will accept all orders, and they will be shipped in approximately 2 weeks when additionally ordered books arrive. Oh Boy, Today is the day I debut my 2 books on background fills! I am nervous and excited (and seriously hoping there are not issues!). 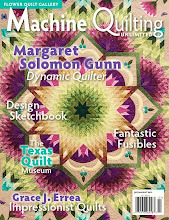 They each list for $25, and may be purchased on my website MainelyQuiltsofLove.com. If you are going to MQX, I will have them there in my classes (or message me). I will also have a table to sell them at on Saturday 2:30pm after my talk (Meet me at the MQX Lecture Zone). About the books... they high quality paper, laminated cardstock covers, spiral bound. 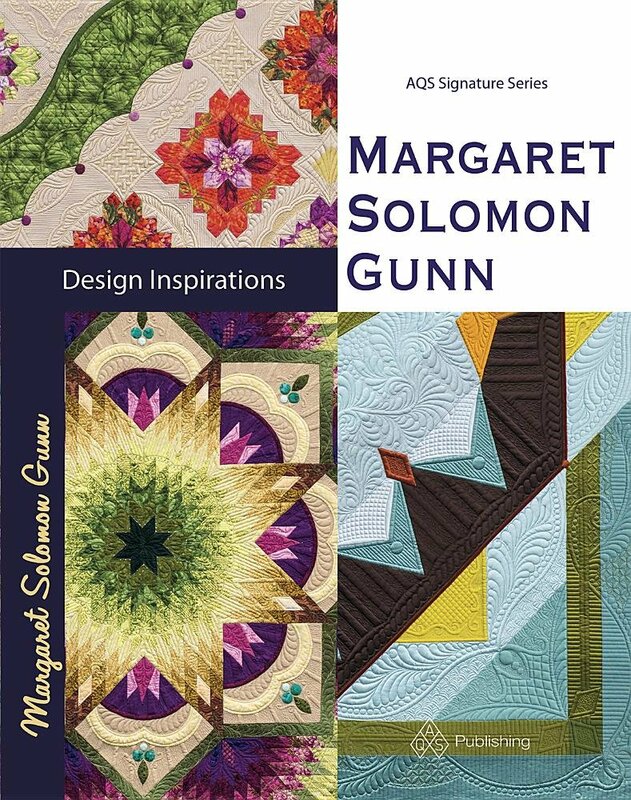 Both books discuss threads, techniques for stitching, and general ways to better accomplish these designs. Lots of photos and illustrations. Designs may be quilted on BOTH longarm and domestic machines! Here is the direct link to my website where the BOOKS may be ordered. If you want one autographed, indicate that in the "instructions to merchant". 1. Dense & Dainty (93 pg) is all about dense fills that can be stitched free-hand. These designs require minimal marking and next to no template use. Though patterns may be scaled to the user's desired size, I like them small anywhere you might be inclined to stipple. Over 100 designs presented. 2. Beautiful Backgrounds (91 pages) is all about grid-based fills. 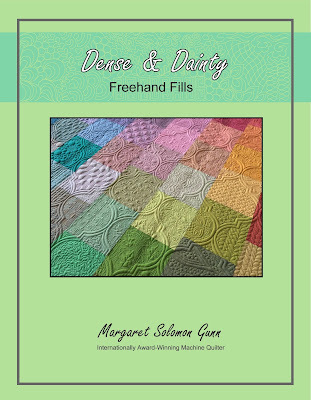 You'll learn marking, basic fills derived from the Sashiko and how to beautifully embellish them. There are LOTS of non-Sashiko fills too, over 80 in all. 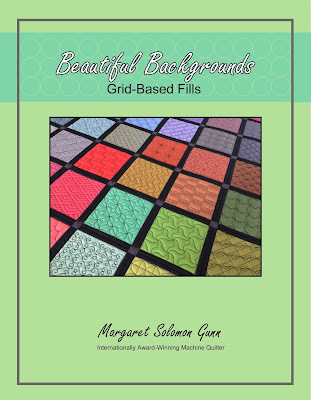 Fills are for all grids including square, point, triangle, rectangle and hexagon. Here are a couple samples from the book. 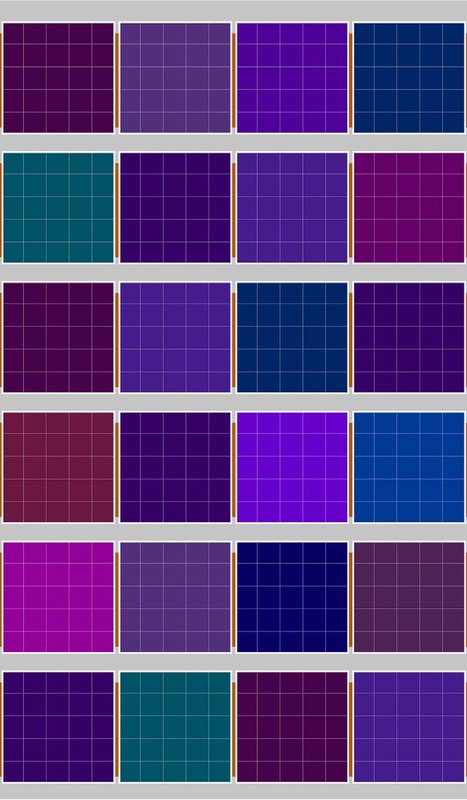 Lastly, for those of you that want to practice the grid-based fills, my Spoonflower shop now sells gridded fabric for 1" and 1/2" square and on-point grids! 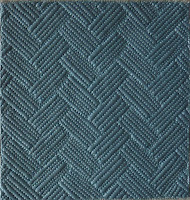 Each FQ has 12 5" gridded squares, and each yard has 48 squares. This fabric is a great accompaniment to the book. Go to Spoonflower.com and in the search box at the top right, type "beautifulbackgrounds" to locate these fabrics. Please note I will not have these at MQX or on my website. 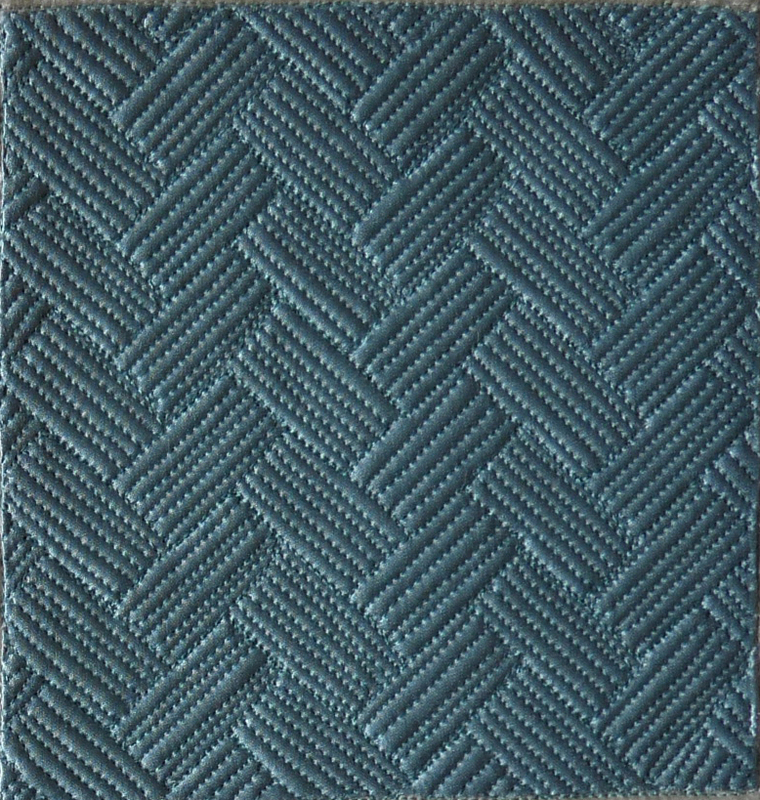 The image above shows what is available on a half yard of the fabric. These are awesome for practicing and completely eliminate the need to mark the grid. The last week was a bust for stay-at-home parents. We had a snow day (yup, only in Maine do you get 18" in March), a day off from school for conferences, and I even had one day that a kid stayed home. It was not my most productive. I did get a sampler for an upcoming class pieced together and quilted though. 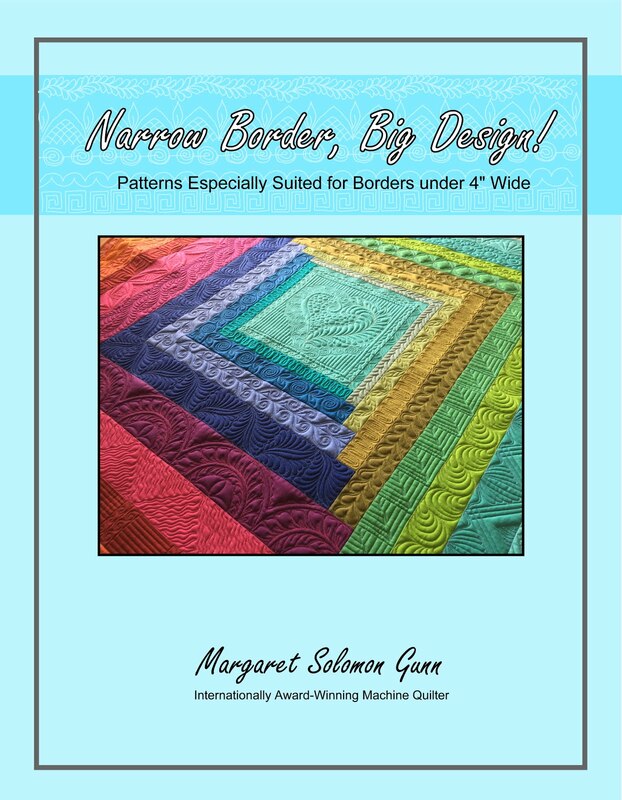 This Narrow Border - Big Designs class will debut at Quilt Odyssey in July, and will also be taught at MQX Midwest in September. I still need to do another sample for the class, but this is a good start (of course quilting this required that I drew no less than 10 pages of designs first!). I am not sure if I will have the gumption to get a book together on these designs before July but it is in the back of my mind. Recent issues with my AQS book leave me wanting to run as far and as fast away from books for a while. It's not an issue that is insurmountable. Its just that I had really hoped that the book would be available before I teach next month, and sadly, it does not look like it will be. My editor has been simply amazing throughout this process; I am truly lucky. I'm fortunate that so much care is being put into the quality. Not releasing until it is right is so much more important than any timeline. Here is a client quilt I spent what feels like an eternity on. It was on my frame nearly 2 weeks. Its a large 90" Sedona Star with machine embroidered applique and lots of piecing. Areas with the embroidery were very stiff and thick, as they sometimes are with the paper-type stabilizer. The appliques don't, as a result, show as much relief as they could. The fabrics are gorgeous desert-like shades. It reminds me of a sunset, especially the fabric at the outer area of the circle. First, the quilt got a whopping 8-9 hours of ditch stitching to stabilize the piecing and applique. Doing this first in a clear thread allows me to go wherever I want with each color thread afterwards, advancing the quilt as needed. It has quite a few colors of thread used - peach, turquoise, a variegated, green and probably a couple I forgot. 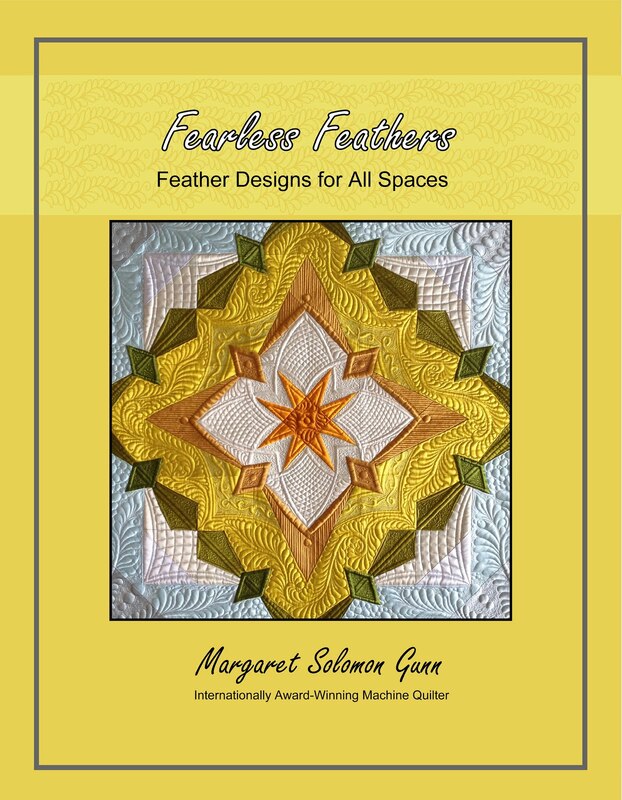 I tried to choose quilting designs for the spaces that would reveal interesting patterns when the entire quilt is viewed. The turquoise center circles have an unexpected pumpkin seed design because one of the fabrics has this pattern on it. The pattern put in the large sunset triangles (below) is intended to draw from the shapes in the embroideries. I made a template, then marked all 9 spaces identically with chalk. This is the center star. The quilt is unusual because all stars have 9 points and there are 9 similar pieces around the quilt. Typically you see 8, or 12 or 16, but not 9. Thanks to all of you that posted about my soon-to-be released books. The second book set arrived this week. I am all ready to make the link on my website live. I am just waiting on delivery of some mailers that were ordered. I am anxious for them to go onsale. For those of you attending MQX in 2 weeks, I will have some there to sell. I will have them in my classes, unless you purposefully flag me down or email ahead of time to let me know you want to buy one. Unfortunately, I won't be at the Ice Cream Social, which would be a great time to have these available to students not in my classes. I will be in Manchester Wed thru Saturday, and I am not teaching on Saturday. If you are interested, and don't want to pay shipping, send me a private message with your email and I will message you from the show. I cannot believe it has been a month since I was here last. I have certainly been busy, with no shortage of great things to share. Winter kind of puts me into a funk because I truly hate the Maine winters, and the seclusion they drive me to. But let me introduce you to one of the projects that has kept me moving steadily since last November, when I started to write the first of these. Yes, I have 2 self-published books that will be for sale from my website in about 3 weeks. They are intended to accompany two of the classes I love to teach, and expand on the material I present in these classes. The first is Beautiful Backgrounds...Grid-Based Fills. These books are actually sitting in my studio right now, but I want to wait debuting them until the others are in house too. This is a high-quality self-published book, 94 color pages. Pages are heavy 80# stock, and the covers are a 100# laminated stock. I labored heavily over self-publishing because I didn't want the books to look crappy, like they were made in somebody's basement. I went so far as to get a proof printed at Amazon's service in January. 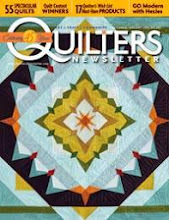 I discovered when the book arrived that more quilters wanted the spiral binding than a book binding, and that Amazon's paper and cover choices were not good enough quality. I spoke to all local printing outfits in my home area, and also got quotes from several mail order services. The best quality for the money happened to be a mail-order outfit. Those of you that order these will agree too. I am confident of that. Beautiful Backgrounds features nearly 75 grid-based fills from the traditional Sashiko patterns to other more modernized fills. There are good-sized color photos as well as numbered color illustrations of the steps for quilting. My illustrations are easy to follow. Dense & Dainty...Freehand Fills officially went to the publisher this morning. I spent the last weekend combing over the proof they sent, making modifications to this and that. It features 95 color pages of over 100 unique freehand fills, suitable for everything from a traditional quilt to the modern alternatives. Illustrations in both books are all hand-drawn by ME...and thankfully by the good graces of my scanner, Photoshop and Illustrator, they have a very professional finish. Here is a snippet from the interior. Like the grids book, this also features LOTS of photos and illustrations, as well as photos from actual quilts where fills have been used. I have done my research, and I know that both of these books are close to the most inclusive books on these two topics that are available on the market. The each will sell for $25. I will post a notice here when the website goes live (Presently it is getting some updates, and details worked out to link safely and properly with paypal), but the plan is to go live the beginning of April!